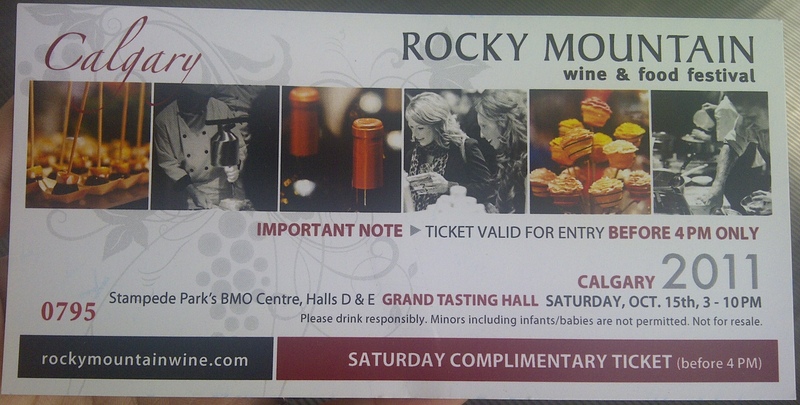 I was fortunate enough to score a complimentary ticket to this years’ Rocky Mountain Wine & Food Festival. How fantastic is that?! 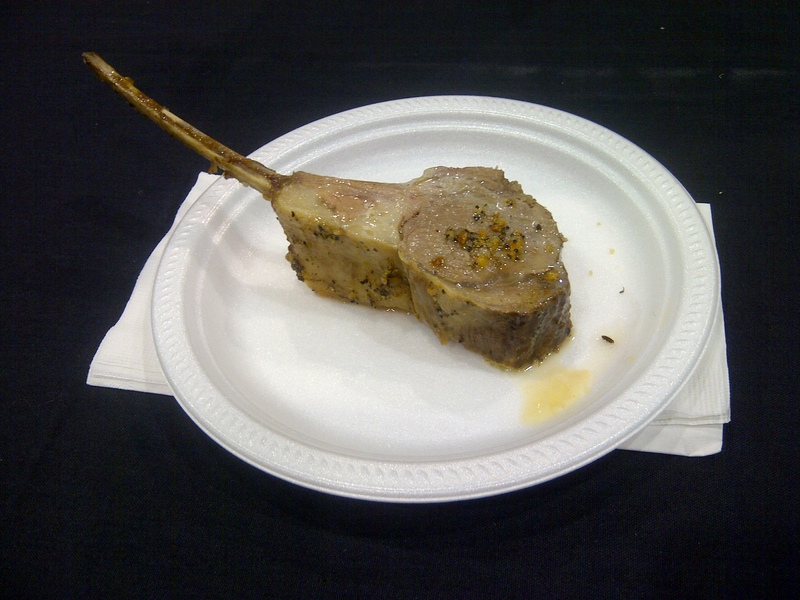 The Calgary Rocky Mountain Wine & Food Festival is a two-day affair that has been around our fine city for fourteen years now, and I personally think that it is a great way to get to try libations and nosh from a large variety of different places. This local show showcases more than 44 local area restaurants and more than 120 beverage exhibitors. This year I arrived armed with my tasting glass, program guide, BlackBerry and $40 worth of tasting coupons. I do have to admit (sadly) that I was looking forward to the food more than the bevies, as I admittedly overindulged the precious night at both the Vin Room and FAB Bar with a variety of drinks including a beautiful glass of 2009 Robert Biale Blind Chicken Zinfindel ($25.50 for a 6 oz. pour) and also a delightful glass of bubbles – 2009 Medici Concerto Dry Lambrusco Salamino ($9.50). I got a little bit of “persuasion” at the first stop. Do you think this is a sign? However, I needed more than a little persuasion to choke this one down. Not a great start to the festival. I found this wine to be so unpalatable with overwhelming mineral overtones that I was trying to find things to eat / drink to get rid of the taste. Realistically, I’m sure that all Persuasion really needed was about another 4 hours of serious breathing time….and maybe some help from cellaring. Notable about this wine is that it is part of Arlene Dickenson’s persuasion line. Who you ask? She’s the CEO of Venture Communications and co-host of the show Dragon’s Den (Click here). In case you are interested – the tasting notes for this are described as black currant, mulberry, pepper, cocoa, licorice, black plum, vanilla spice, violets and earth. (CSPC# 746099). After a quick stop for water, we found a tasty bite to eat. 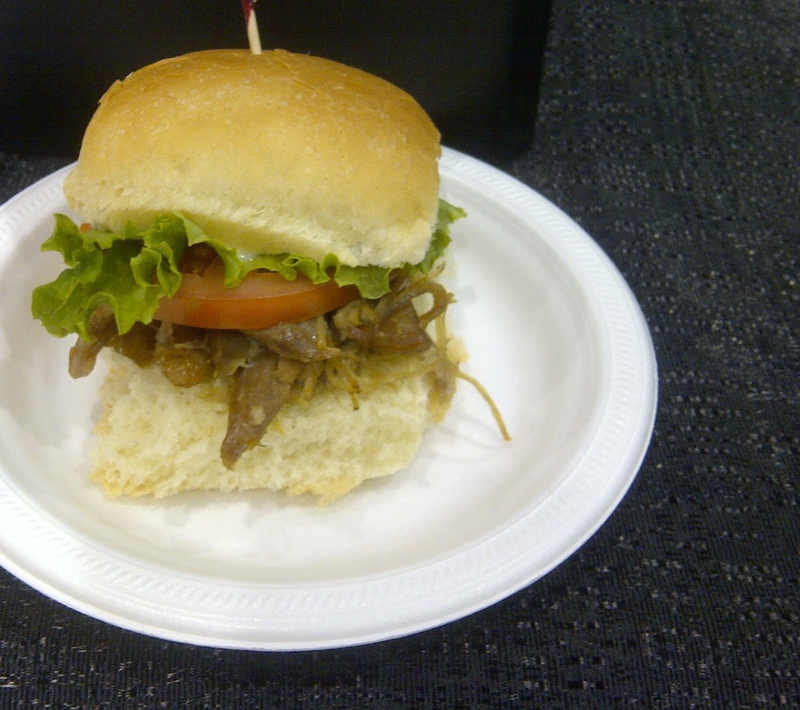 Enter, the Duck Confit Slider. This tasty nibble was from Banff Ave. Brewing Company. I would drive to Banff in a heartbeat to have one of these any day. Juicy, succulent duck, and a little piece of cheesy (brie) goodness tucked away at the bottom. Utterly delightful! Billed as one of the places serving decadent samples was The Newport Grill on Lake Bonavista. I had heard so many wonderful things about this restaurant from family, friends and colleagues. So naturally, I wanted to try out their Braised Pork Belly. Braising is described as a way to turn tough cuts of meat into something tender and flavourful. Sadly, they fell short of my expectations and was THE WORST of the worst food-wise. Instead of something that I expected to just melt in my mouth, I got a hunk of pork belly jerky. 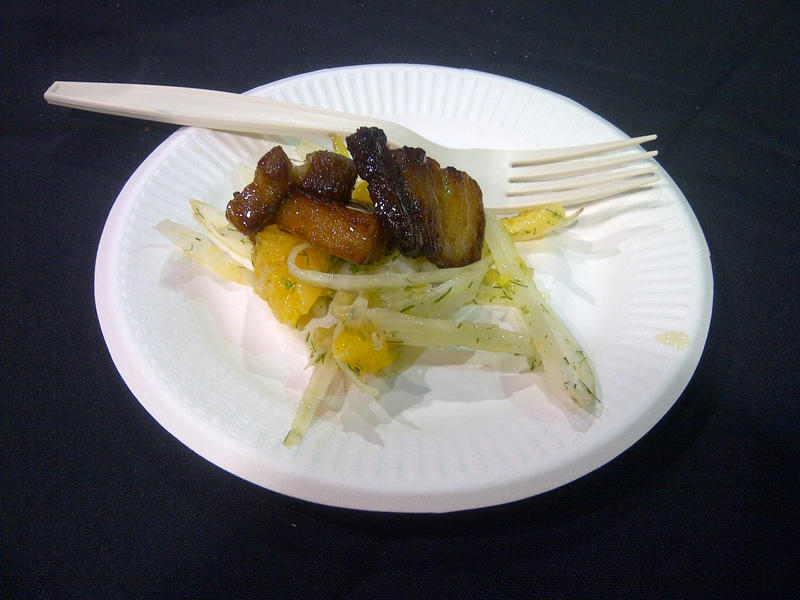 The slaw was nice and refreshing, but the little oinker totally ruined the dish. Big thumbs down. 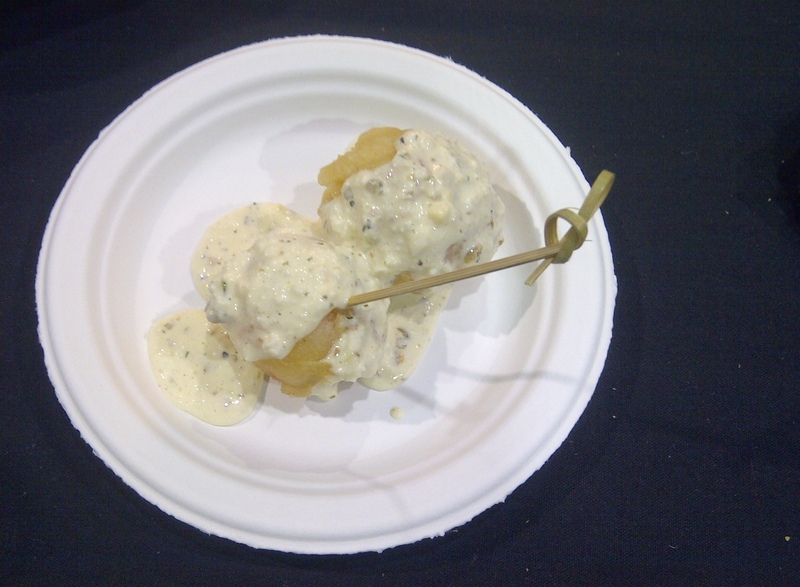 Also billed as being new and notable to the show and serving delicious samples was Spur Gastropub. 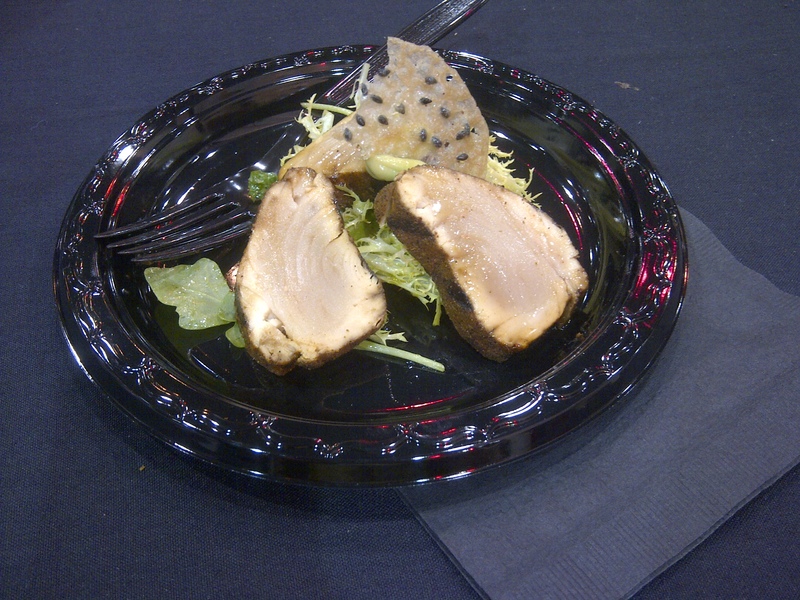 They were offering Ancho chili rubbed albacore tuna. Now anyone who knows me, knows that I adore fish. I could seriously eat fish every day…and tuna is one of my favorites. I also really detest wasting food, so it pains me when fish is prepared this badly. There were three of us who eagerly tucked into this dish. The tuna, was tough, rubbery and lacked any sort of flavour profile. Ughh…half the plate remained untouched and ultimately ended up in the trash bin. It’s a shame really, as this one sounded like it could have been amazing. Thankfully, we did not continue on this path of disappointment. From here on out, we tasted one great thing after another. 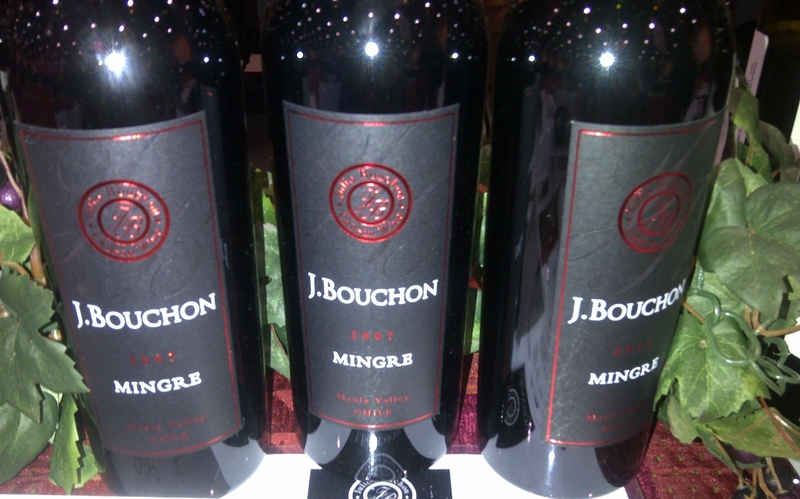 The 2007 J. Bouchon Mingre from Chile was full of spice and everything nice. There was a lot of rich, ripe fruit and berries and an amazing spicy note on the nose. This wine is aged perfectly for our immediate enjoyment. (CSPC# 715588). Lamb Lollipops from Broken Plate…I’ve never had a bad dish from Broken Plate. ‘Nuf said. This next one really surprised me, as I’m normally not a big fan of Canadian Wines. Yes, I should support my local vineyards…but honestly, there are less than a handful of wines that I’ve tasted from around these parts that make me want to JUST drink purely Canadian (I’m a sucker for Napa Wines mostly). The 2006 Desert Hills Mirage (from Desert Hills Estate Winery in Oliver, BC) is a blend of 40% Cabernet Sauvignon, 30% Merlot, 15% Malbec, 10% Cabernet Franc and 5% Petit Verdot. It’s a full-bodied wine that has everything you could ever want in a wine…plum, cherry, currents, spice and a smooth chocolate finish. (CSPC# 80473). We can find this beauty at Zyn The Wine Market, and Willow Park Liquor Store among other places for about $50. Next up were the Yak Balls from Waymarker Hospitality . 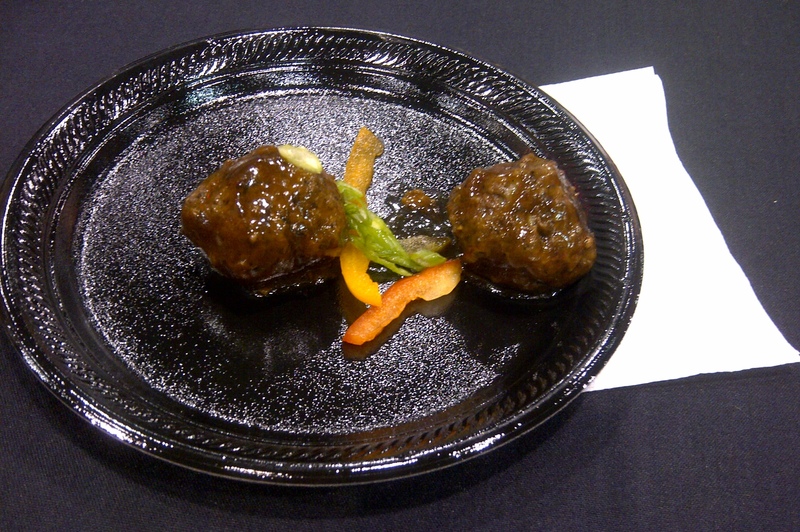 No, I don’t mean “balls” from the Yak (as in testicles), but meatballs made from Yak meat. Apparently, yak is healthier to eat than skinless chicken and fish. Some research also shows that it is highly recommended to not cook beyond ‘medium rare’ when serving yak, as it cooks faster than beef. I found the Yak Balls were extremely lean with a slight hint of gaminess…and thought that they needed a lot less cooking time (although, this is by no means the fault of the yak). 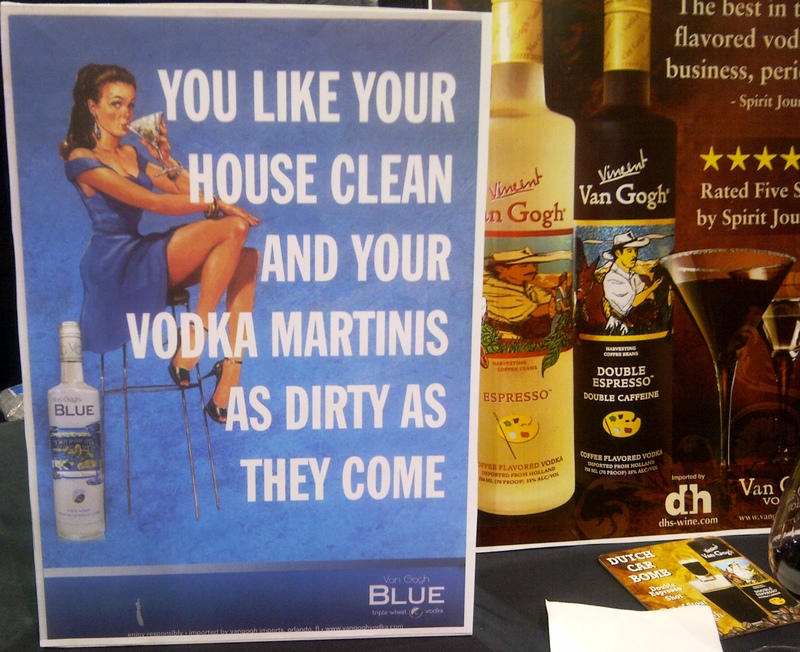 Now I’m not sure that I would ever order them…but at least I can say that they were tried. JAQK Cellars makes an amazing Cabernet. 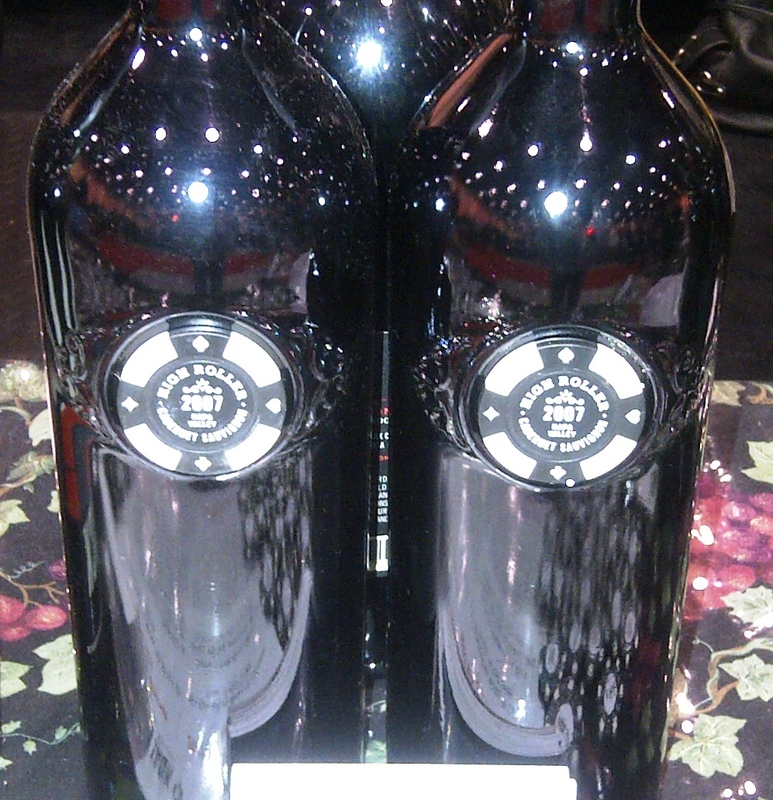 High Roller Cabernet also happens to be their flagship wine. This delicate Bordeaux style Cabernet is made from 100% Napa Valley grapes (Am I biased here? ), and the wine is truly delicious, balanced, complex and elegant all at the same time. I particularly loved the bottle. Looks like a poker chip is fused into the side. (CSPC# 736784). Retails for about $75. The Lobster Corn Dog from UBU Lounge was the group favorite (no contest). Although they did not photograph well, the lobster was perfectly succulent with a delicate thin and crispy coating of tempura batter. If I wasn’t so stuffed from all the other places we tried, I think I could have easily ordered another few batches of these corn dogs. UBU Lounge is located in The Grande Theatre in the old Velvet location..and serves what they call Asian Avant-Garde cuisine. I’ll definitely be visiting there soon. 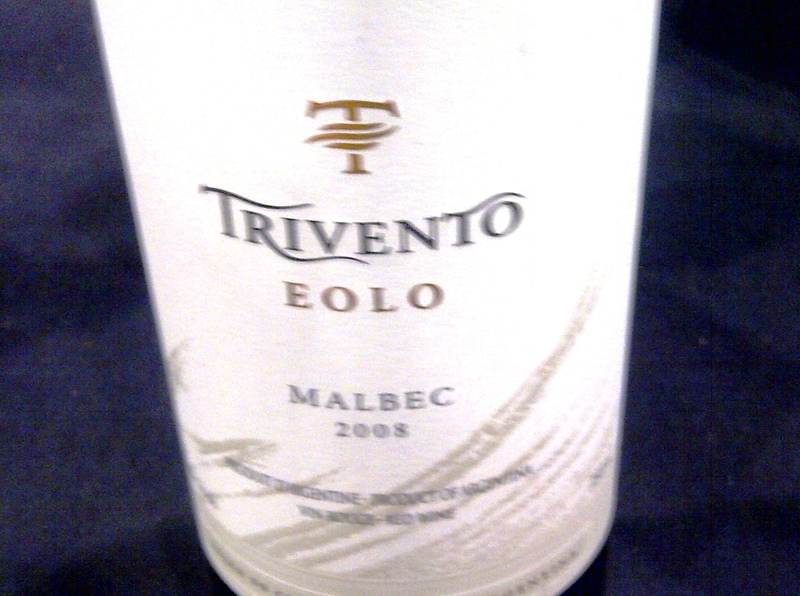 2008 Trivento EOLO Malbec. You know, that saying “saving the best for last”? Well, this last wine I tried was the best one for my palate. In the glass, it was a deep reddish-purple that stained the glass immediately. I got ripe berry, figs and cherries on the nose, and it was sweet, and delightfully juicy with flavors that danced in my mouth. 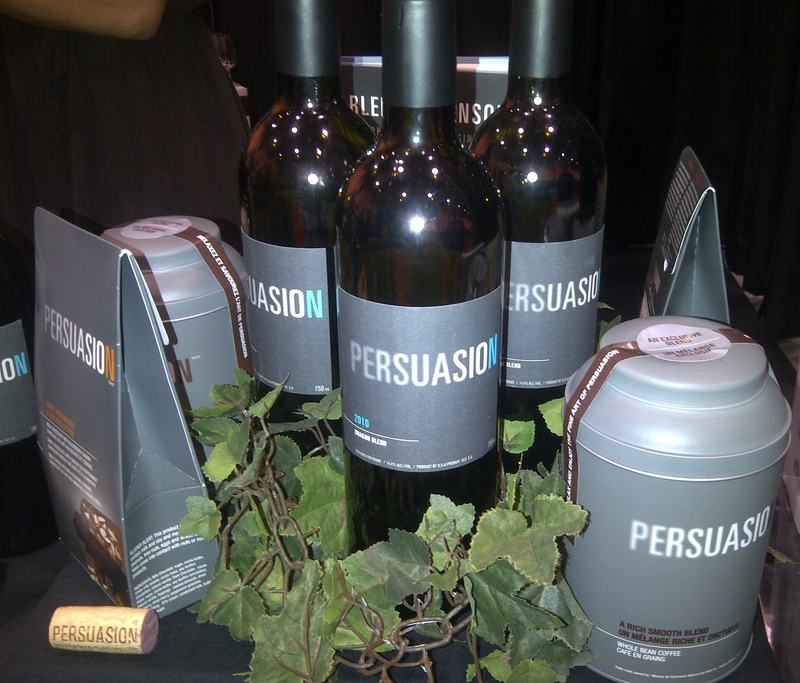 This 2011 Wine Access International award-winning wine retails for approx. $110. (CSPC# 736273). Emeri Pink Moscato (CSPC# 736327) for being a light, fun 8% alcohol wonder with musk and rose petal on the nose. It has a velvety and creamy feel on the tongue and is packed with strawberry flavour and bubbles (who doesn’t like bubbles!). This one would be amazing during patio season. Switzerland Cheese Marketing – the Gruyère was aged in a cave and the best I’ve ever had. Papa Chocolat. Those salted caramels….mmmm! I wanted to buy every single chocolate in that booth. Bassano Hard Soda – The Raspberry pomelo went down way too easy.